The City of Astoria is hosting the second public event for the Uniontown Reborn project on February 6th from 4:30 - 6:30 p.m.at the Holiday Inn Express, located at 204 W Marine Dr. The City invites the Astoria community, including Uniontown residents, business, and property owners, to hear about the effort to date on Uniontown Reborn, the project’s goals, and provide direct feedback on future land use code and transportation investment considerations. The public event will feature an introductory presentation at 5:00 p.m. on the Uniontown Reborn Master Plan. Following the short presentation, the event will move into an open house format at 5:30 p.m. Attendees will be able to provide direct comments on alternatives through an interactive mapping exercise. The exercise will include two stations – one dedicated to land use alternatives and one dedicated to transportation investment options. Project team representatives from the City, ODOT, and consultant team will be available at each station to help participants through the exercise and answer any questions the attendees might have. Public feedback is essential to the success of the plan and future development of the neighborhood. 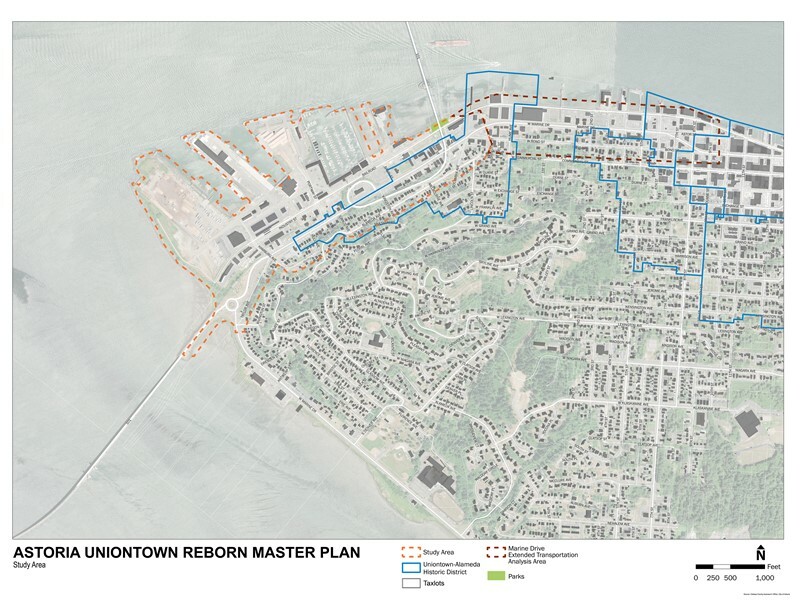 In May 2018, the City of Astoria launched “Uniontown Reborn, Creating a Great Pacific Northwest Gateway to Astoria”, a community planning process funded through the State of Oregon’s Transportation and Growth Management (“TGM”) Program. Uniontown serves as a gateway to Astoria and as an important center for industrial and commercial activity. The Astoria Megler Bridge brings people across the Columbia River from Washington, and the New Young’s Bay Bridge brings people from the coast. While the Uniontown neighborhood has a central location and historic character, it has not experienced the same level of investment as downtown Astoria. This is due in part to the lack of a unifying vision for the neighborhood to guide public investments and support private redevelopment activity. As future growth and development will impact traffic, neighborhoods and businesses in Astoria, now is the time to focus on strategies and priorities for the future of this unique, historic working waterfront community. The purpose of Uniontown Reborn is to better integrate transportation and land use planning and develop new ways to support economic development along with safety and access enhancements to improve conditions for pedestrians, bicyclists, transit users, and motorists. The project will lay the groundwork for design and construction of streetscape and lane reconfigurations improvements on West Marine Drive/U.S. 101, along with potential land use and development code refinements to foster community-supported future development. The Uniontown Reborn Master Plan Study Area is the portion of West Marine Drive from Smith Point to Bond St. in the City of Astoria, including land adjacent to West Marine Dr. and land to the north that is designated for commercial, industrial, and mixed-use development. The project will also consider street design alternatives for West Marine Drive from Bond St to 8th St. The Uniontown Reborn Master Plan will develop a unifying vision for Uniontown and adjacent lands to maintain the area’s distinct historic aesthetic, coordinate land use and transportation improvements, and identify economic opportunities. Establish a vision for the community’s desired future for the Study Area, along with specific objectives and guiding principles for the development of regulations, design standards, and streetscape improvements to help achieve the vision. Build on previous planning and visioning work conducted for the Study Area and surrounding areas, including the Astoria Riverfront Vision Plan, Transportation System Plan, Bridge Vista Code Amendments, and other relevant efforts and plans. Create an attractive and welcoming entry to Oregon and City through the use of signage, art, landscaping, and other public improvements. Facilitate the execution of the Astor-West Urban Renewal Plan, which includes part of the Study Area, to help fund the Project. Strengthen the livability and economic vitality of the Study Area by identifying opportunities and removing barriers to development and re-development; enhancing walkability; improving bicycle and transit infrastructure, improving neighborhood aesthetics with landscape and streetscape elements, and enhancing access from adjacent neighborhoods. Create a balanced and efficient multimodal transportation system that better accommodates a variety of modes to offer attractive options to driving for those who live, shop, and travel through the Study Area. Actively engage community stakeholders in a thorough visioning process to encourage their support of the Project and its conclusions and to spur private investment in the Study Area. Documents relating to this project will be posted below, as they become available.